When I was taking pictures I keep spilling it all over my hand. but that one has a way stronger lemon scent! Since ffeeee has always been my favourite color, I loved the packaging!! Ingredients include Mulberry, which contains 5 kinds of natural berry essence. These essence include Vitamin B3, which can prevent melanin from forming dark spots on your skin, bringing out the whitening effect. The product is made using the nanology technique, so it's easy to penetrate your pores and absorbs quickly. 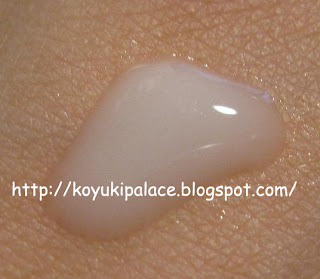 If your pour the toner on a cotton pad and rub it on your skin, it will remove dead skin cells as well. I do not feel any pressure using this product.